EDITOR’S NOTE (Jan. 9, 2018, 3:45 p.m.): After further reporting, FiveThirtyEight can no longer vouch for the broadband data set used in this article. We stand by the article’s broader point — that there are inequalities in broadband availability in the U.S. — and the reporting we did on the ground. But if we’d known before publication what we know now, we would not have used the data set to decide where to report on U.S. internet inequality. A more extensive discussion of the flaws in the data set can be found here. The Washington, D.C., we often hear about is the District of iPhones, the land of news alerts and eyes on screens. It has the highest median income of any metro area in the country, and its suburbs are filled with some of the highest proportions of well-educated people in the nation. And yet, according to data modeled by researchers from the University of Iowa and Arizona State University, the District of Columbia is the 29th-worst county1 in the country when it comes to share of adults with home internet faster than dial-up; only 28.8 percent have it.2 Of the bottom 73 counties, the district is the only one with a large metropolitan area. The city has a population of around 600,000. The next-largest county in the bottom 73 has only 33,000 people. Lack of access to fast internet is typically thought of as a rural problem, but many of the country’s urban areas make a poor showing in the share of adults with access to fast home internet. The Bronx has only 35.3 percent access, and Manhattan fares only slightly better with 35.6 percent access; Clark County, Nevada, home to Las Vegas, has 39.1 percent access. While rural residents’ access might be hindered by their remote location, city residents who don’t have broadband often lack it because of income disparity and a dearth of basic knowledge about the internet and computers. Many urban residents, particularly older ones, haven’t been exposed to the internet or computers much in their lifetime. And without that knowledge and exposure, a person is likely to be further marginalized in economic and educational opportunities, caught in a cycle of literal and metaphorical disconnection. 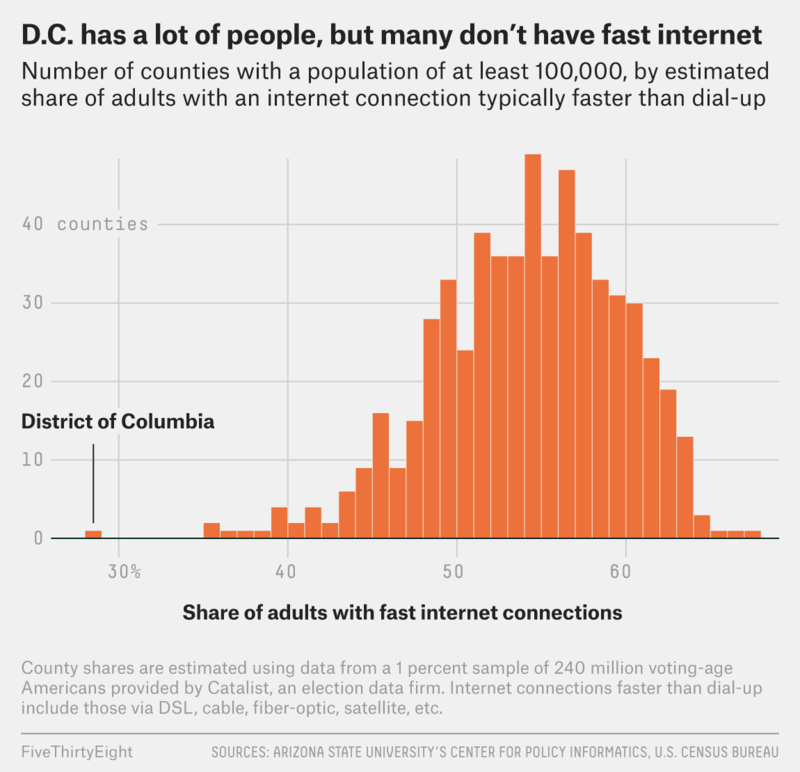 The District of Columbia, well aware of its shortcomings, has developed a “digital inclusion initiative” to bring internet access and computer skills to communities that are often short on funds and access to technology in the home. The Connect.DC initiative works to provide computer courses and subsidize internet access and devices in order to bridge a divide that many worry holds back a skills-based economy and diminishes the opportunities of significant parts of society. Parked across from us was an idling bus, and inside were nine students learning how to create an email address from Leo De Leon, an instructor with the nonprofit Byte Back, which works with the district government. The bus, the district’s mobile tech lab, is among the initiatives that Vemulapalli and a small team have undertaken to spread what might be called internet awareness. To bridge the digital divide, she said, their work had to be three-pronged: “You need the device, you need training, you need the connectivity.” The mobile tech lab is used to teach people the basics: how to type, how to browse the internet and how to apply for a job online. Many residents have smartphones or browse online in libraries, but home connections offer a different experience and aren’t as common. Vemulapalli said that free Wi-Fi in public housing and rec centers was key to getting residents online more reliably. Even with programs that helped supplement home broadband connections, many were unlikely to sign up for the service long term. In part, that’s because residents might not see the pertinence of internet to their lives. A pamphlet from Connect.DC provides a litany of reasons why residents might want to use the internet: applying for jobs, finding the best school for a child, downloading apps to track health, searching for housing and depositing checks. 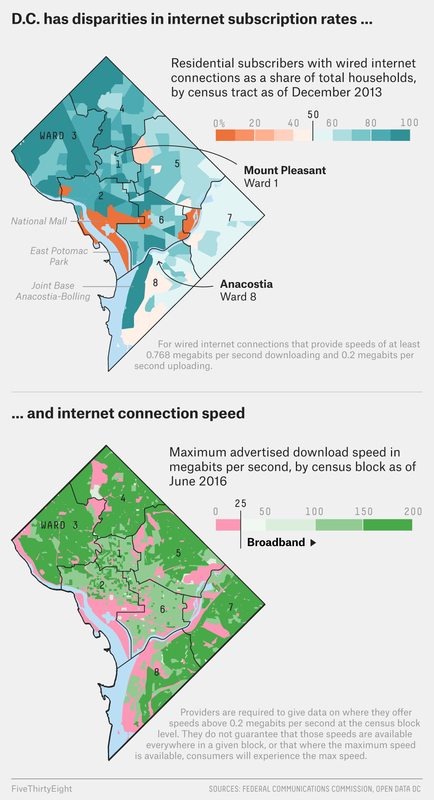 Ward 8, across the Anacostia River, is where the most — 34 percent — computer literacy classes were taught in 2016; the area is mostly black, as are the majority of students that Connect.DC reaches with the classes. But De Leon’s class was being taught that evening in Spanish, the native language of many residents of the Mount Pleasant neighborhood, where the bus stood idling. To recruit students, Connect.DC runs bus advertisements and goes door to door. De Leon, a former student in the same class he now teaches, said that he found out about the course after a serendipitous cold call to a prepaid phone he’d recently purchased. That was in 2014. Before that, De Leon said he had used a computer, but on a limited basis. “I didn’t know how to cut, paste, stuff like that,” he said. Six men and three women, most who looked to be in their 40s or 50s, sat for two hours while De Leon helped them create Gmail addresses and passwords, and practiced their typing skills. Some, such as Abel Hernandez, 52, have jobs — he works for Arlington County’s Department of Parks and Recreation in Virginia — and want to enhance their computer skills to help their careers. Hernandez, who was still wearing his reflective yellow shirt from work, said the class would help him learn how to research for the job, how to check his county email address, and how to look up his paychecks online. Gloria Marquez, 57, doesn’t have a job and wanted to take the class, in part, because potential employers always ask her about computer skills and she tells them she doesn’t have any. They ask for an email address to stay in touch, as did her former students. (Marquez taught elementary school in El Salvador.) “I was falling behind,” she said. “Who’s running the immigration advocacy? It’s the gringos,” he said. “I’m not knocking the gringos,” Griffiths said, but the lack of Latino involvement worried him. He’d been to a meeting recently about Washington, D.C., as a so-called sanctuary city, and the ratio of attendees had troubled him. “Four hundred people and there were only two Latinos — everyone was a gringo. I said, ‘What the hell is going on?’” In practical terms, activism in the 21st century came down to connections made online. “We’re not involved because we’re not communicating,” he said. D.C. is a “county equivalent” entity, according to the census. The researchers estimated county totals using data from a 1 percent sample of 240 million voting-age Americans provided by Catalist, an election data firm.